While I was on my own weightloss journey, a certain friend of mine was also undergoing his and I am very proud of his outcome!!! In March of this year, I have decided to make my life better, to look and feel better by becoming a healthier individual. I got to a point where I was getting sick with illnesses that I shouldn’t even be experiencing at my age, where none of my clothes looked good on me anymore and where I was just plain tired and sluggish 90% of the time. Blech. So from then, I started going to the gym 4 times a week to lift weights and started doing cardio about 5 times a week. I also modified my diet and general lifestyle. From 235lbs, I am now down to 200lbs and counting. My waistline has gone from 40 inches to 34 inches. On the treadmill, I used to run for just 30 seconds and feel like dying afterwards. Now I can run 5 minutes straight and still have breath to live J Yay me! It’s an understatement to say that I feel good. I feel GREAT now. I am much healthier and I rarely get unnecessary aches and pains due to being unhealthy. Of course I am not stopping here. I am looking to live a more active life, get back into sports and be alive and healthy for the next 40, 50, heck even 60 years! That’s why when I heard about the Bull Runner Dream Marathon 2011, I decided to give it a try as I know the training that would come with running a marathon will test my strength, will and determination. I have never done any competitive running in my life. I’ve never joined a running event because I’ve been telling myself I cannot run, because I feel so as well. Even with the weight loss, the last time I was able to run for an hour straight was in 2002. I want to change this. And I will change it. Today I formally started with the marathon training program provided by Coach James Lafferty. I have received the training program from him a few days back and have been emailing him my questions regarding my current body building program and his marathon program (Yes, I’m OCD like this ). Basically the first 2 weeks will be an introduction to running, which is quite easy and breezy as it involves mostly walking. So this morning I did a 30 minute walk which I will do again one more time this week. On the weekend I will do a long walk of 45 minutes. I know I should enjoy the lightness of the training now as eventually I will be doing 50 minute runs that will progress to more than 3 hours as I go through the whole program, which I will complete in 22 weeks. I will be posting pictures and videos of this journey. Join me as I document my training from today until marathon day! 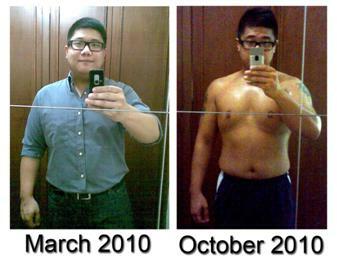 Greenpinoy, you are an inspiration to all of the people who are trying to lose weight. As your friend, I am very proud of you (yeah, my parents are the number one listeners of the pride I feel over your success! haha!) Congratulations for being healthier and for having a more awesome lifestyle! Inspire. It's GREENPINOY'S LOOKALIKE! JUGS from SHOWTIME & ITCHYWORMS. 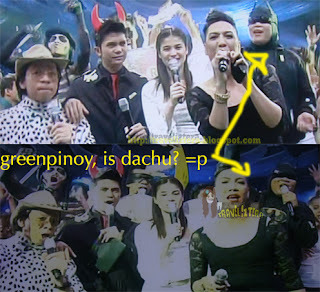 Greenpinoy also LOVES BATMAN. Haha! Took this from my TV so credits to my tv and ABS-CBN's Showtime. HAHA! Galing naman ni Greenpinoy... todo self-discipline ang ginawa nya, hanga ako sa kanya kasi ako hirap dyan... basta may pagkain kain lang ng kain. Wow. Ayus ah. Ang laki ng binaba ng timbang niya. Congratulations Greenpinoy. Eto na ba ngayon ang blog niya? Haha. Waw. Puno ng determination,, hanggang first lang ako, tinatamad na pagkatapos. Go! Aja! huwaw.7 months, anlaki ng pinayats niya. mukang masaya ang marathon training.